De-silting works will ensure good drainage and improve habitat in the area. 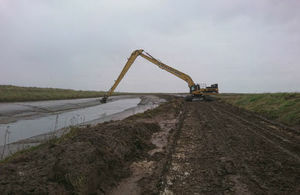 The Environment Agency has carried out de-silting work at Tetney Haven. The Environment Agency has de-silted a section of the Tetney Haven, helping reduce flood risk and boosting the area’s ecology. The work, part of the EA’s regular maintenance programme, saw excess silt removed from approximately a kilometre of the Louth Canal and from around the sluice gates at Tetney Lock. Silt builds up naturally at the sluice as it settles when the flowing water in the channel loses momentum at the sluice gates. Removing it means water can continue to flow easily from the canal into the Haven. Along with other routine maintenance on the channel, removing the silt helped reduce flood risk to approximately 500 local homes and businesses. The nutrient-rich silt was then spread on the salt marsh adjoining the banks of the channel, and work was also done to improve drainage on the salt marsh. These improvements help the natural wetting and draining cycles of the soil that encourage vegetation to grow. The plants help prevent erosion and stabilise land which serves as a front line of flood defence by absorbing much of the force of tidal waves. This work has also helped improve, preserve and extend the salt marsh’s ecology, made up of salt-tolerant plants and up to 300 species of invertebrates, half of which are unique to this environment. These conditions, in turn, provide valuable habitat for migrating birds, some of which are endangered. This is a perfect example of how we aim for the most benefit for people and the environment from everything we do. We have a regular programme of inspection and maintenance on our flood defences, and we’re always looking for ways to achieve extra benefits at the same time. In this case, while we had our equipment on-site, we were able to use it in another way to give a boost to ecological conditions in the surrounding area at no extra cost. De-silting Tetney Haven took just over seven weeks and cost £127k. It was last de-silted 10 years ago, and the Environment Agency’s modelling shows it is unlikely to be needed again for another decade. De-silting is not always the best solution for reducing flood risk; we carefully consider each situation on a case-by-case basis to determine whether de-silting is cost-effective and will have the desired result of reducing risk. In the next financial year, the Environment Agency will spend approximately £12m on flood defence maintenance to reduce risk to local communities. Although the Environment Agency continually invests in maintaining and improving flood defences, no defence can ever completely remove the risk of flooding; therefore we’d encourage people to sign up for our free flood warnings by calling 0345 988 1188 or visiting www.gov.uk/flood. The Environment Agency is required to prioritise funding for asset maintenance and repair where it will have the most benefit in reducing flood risk. Saltmarsh provides vital habitat including food and roosting opportunities for over-wintering birds such as seed-eating twites, which are on the Birds of Conservation Concern ‘red list’, and waders such as redshank. Saltmarshes support around half of the UK’s breeding redshank population.